You might remember my initial reaction to seeing Pitch Perfect - somewhere over the Rockies. I have to say, over time, and multiple rotations of it on HBO, my take on it evolved just a little. Don't get me wrong, I can still shoot cannons through some of the holes that are in that movie, but I can also appreciate some of the performances more than I did at 32,000 ft. It was easy to make fun of the Bella's early performances. It was fun to watch Adam Devine. It was more fun to watch Adam Devine and Rebel Wilson. But you saw the ending coming a mile away. 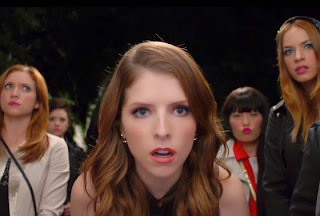 So, yes, we were awaiting to see Pitch Perfect 2. It's not like we were going to stand in line to see Mad Max. ....and we got in a day earlier than the official opening date. And it seems no one else knew - as there were a total of eight of use in the theater. ....and we were the only white gay men there. Actually we were the only gay men there. ...and the only white folk too. We were a triple minority. I think this is the first movie I've been at opening night since the Temple of Gloom. I have learned not hold out high hopes for most sequels. The original film was only better than average. I've seen great films have their sequels turn to crap.....and I'm not touting Pitch Perfect as a great film, so it could fall......and fall hard. It is safe to say that they tread no new ground here - be it the writers, director or stars. The only big difference is the cameos - of which there were zero in the first film. This time you get Snoop Dogg....errrr Lion, Tobias Fünke David Cross, Clay Mathews and Keegan-Michael Key (plus the cast from the View and the Voice). Most of them don't distract from the movie. I miss more who is not in the movie. No "Donald" or "Unicycle". Barely any "Jesse". I do believe the Treblemakers only had one song. I get it's not the same story as the first, and it's set three years later, but........ And let's face it, the musical performance - the good ones - were fun to watch. There are fewer of them this time around, or at least it seems, though the Riff Off lasts longer. While giving no true spoilers, once again, you can see the ending coming from very early in the movie - and on multiple levels. That doesn't necessarily make it less enjoyable. But to truly appreciate the movie, I might need to see it 3-4 dozen more times on cable. I saw the original also at 32,000 feet. Don't remember much other than it was an appropriate 32,000 ft film and fairly enjoyable. I think I'll wait to see it from home on Demand. This is my kind of movie, but I prefer to see these kind of movies from the comfort of my home since there aren't really any special effects.